Summerwell's Lot 15 kitchen featuring Poggenpohl cabinetry, Miele appliances and Dornbracht faucet. Recently named "Community of the Year" at the 2017 Tribute Awards by the New Home Council, Summerwell’s 16 homes, designed by renowned McCullough Architects, reflect a contemporary design aesthetic with clean lines, open spaces, dramatic interior lighting from sensitive window placement, as well as a decidedly upscale palette of materials, fixtures, fit, and finishes. The architectural aesthetic is cohesively reflected in the interior design of each space, most notably in the modern and functional kitchens, brought to life by Six Walls Interior Design. The ultimate goal was to harmonize beauty and usability to fit the needs of a variety of homeowners at various stages in their lives. The result is stunning kitchen design that makes sense and meets every credential you ever had for your dream kitchen. “These kitchens are meant to be the heart of the home,” says Six Walls’ lead designer, Roshini Hauser. We sat down with the Six Walls design team for a closer look at the attention to detail that went into building these spaces. What has been your biggest source of inspiration for this project? Roshini Hauser, Lead Designer (RH): Being able to develop four unique color palettes that were unexpected and appealed to a majority of buyers was key to a successful overall design. I pulled design inspiration for these unique color palettes from the architecture of the home and outdoor setting of the development property. Summerwell's Lot 7 wine wall. The homeowner worked with the design team to craft this beautiful wine wall, a personal expression of their new home. What type of homeowner are these kitchens designed for? Jennifer Kowalski, Kitchen & Bath Specialist (JK): What I love most about the circulation of these kitchens is that they are designed for every type of homeowner. 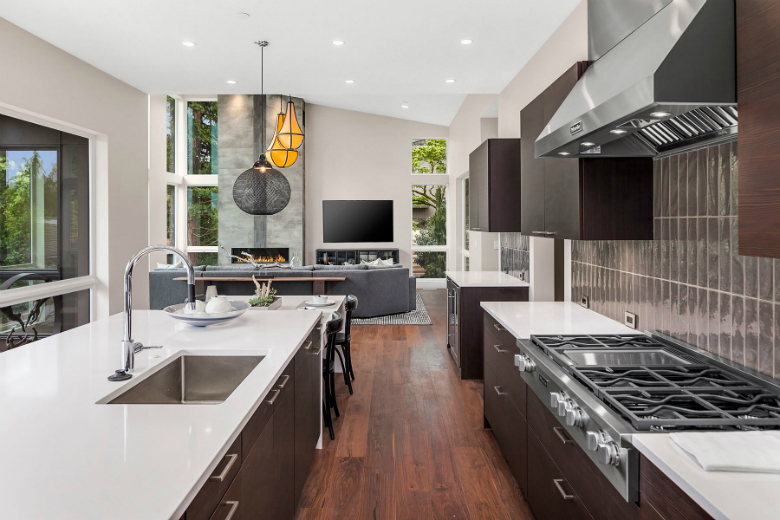 The kitchens are social with expansive islands that allow guests to engage with the cook, or for kids to sit and do homework while mom and dad prepare dinner. It doesn’t matter if you entertain frequently, or if it’s just you and your spouse; the kitchens are designed to acclimate to each of those scenarios. What are a few features that really set these kitchens apart from other homes in this area/price range? JK: The quality of the cabinetry package alone is above and beyond what any other developer out there is offering in their projects. Poggenpohl is a luxury German line of cabinet, known for their impeccable engineering, innovative designs and stunning finishes. It’s a product that you typically only see in custom homes. JK: I absolutely love Poggenpohl. It doesn’t get any better than a luxury kitchen outfitted with this product line. My other favorite piece is the Dornbracht pull down faucet. It’s the jewel of the kitchen. Its style is architectural and sophisticated. Homeowners don’t realize that a kitchen faucet can be luxurious until they’ve used a Dornbracht faucet. It’s single-piece solid brass, no seams, with a perfect polished chrome finish (no blemishes). The handle and pull down operate so smoothly, you get zero resistance. It’s a piece of art, really. Poggenpohl cabinetry; Interior details of the cabinets can be fully customized. What are some of the customizations that are available? JK: Each homeowner is given a complimentary consultation with our Kitchen & Bath Specialist to help select interior accessories from Poggenpohl. Interior drawer accessories include knife blocks, flexible utensil inserts, basic drawer dividers, spice inserts…the list goes on! Poggenpohl’s program allows you to build and assemble the accessories in each drawer to the exact specifications of the client. What’s a common thread between the Summerwell kitchens? RH: The common thread in these kitchens is an overall feeling of approachable luxury. A truly well-developed and thoughtfully designed space, incorporating beauty and function for anyone looking for their dream home. Summerwell's Lot 16 kitchen featuring Poggenpohl cabinetry, Miele appliances and Dornbracht faucet. “There is a unique sense of place that one gets when stepping onto the homesites at Summerwell that is an experience in itself,” says Six Walls’ CEO and President, Dawn Wilkinson. Of the 16 homes on site, there are still 7 properties available. Visit summerwellhomes.com for more information.